NVIDIA kicked off the year with their GTX 1080 Ti and they are ending it with the GTX 1070 Ti. Both launches are pretty significant in a sense. The GTX 1080 Ti was launched at a time when everyone was anticipating the AMD Radeon RX Vega series graphics card. It may have seen as NVIDIA acting in response to the attraction that AMD’s upcoming series was gaining. The GTX 1080 Ti launched early and even after RX Vega’s arrival, it continues to be the fastest gaming graphics card. The GeForce GTX 1070 Ti is another story though. It launched after the RX Vega cards. Out of the two Vega cards, the RX Vega 56 was called out as the best one with stunning perf/$. The Vega 56 has been seen to outperform the GTX 1070 while staying right under the GTX 1080. To fill this little performance gap, NVIDIA is introducing the GTX 1070 Ti. There are reasons why the GP104 GPU is selected for the 1070 TI, as it’s one chip that can be seen as being under utilized for the desktop GPU segment. The difference between the GTX 1070 (1920 Cuda Cores) and GTX 1080 (2560 Cores) is quite evident. While there are several mobile SKUs of the GP104 GPU, the desktop market will be finally getting a new SKU. This SKU (GP104-300) is very close to the GTX 1080 but it also has some features of the GTX 1070. The 2432 cores for example are just one SM away from the GTX 1080’s full 2560 cores while the card still uses GDDR5 (8 Gbps) memory instead of G5X to limit the manufacturing costs. It’s a 180W TDP design but NVIDIA has done something different this time. Rather than allowing AIBs to offer factory overclocked variants, they have set a reference clock lock across all AIB models. This means that while AIBs cannot ship cards with out of box factory overclocks, their cards can be overclocked manually by the user. This means that having better PCBs, more power on the board and better cooling systems matter a lot this time. So users paying extra for the custom cards will reap the reward of better performance and overclocking support. But those who get a reference card will still be able to overclock and find good performance that is slightly under the GTX 1080 and the gap can simply be shortened by overclocking. It’s certainly not convenient to be forced to overclock the card manually as many users have become accustom to factory overclocks and AIBs are not to blame here as the decision was made by NVIDIA. Looking at the Titanium model, MSI basically put a different theme over the Gaming model. Instead of going for red and black, they chose silver and black which to be honest looks very appealing for gaming PCs. On the other hand, the cooling assembly is slightly better than the Gaming model that allows for lower temperatures and better stability under overclocked conditions. This allowed us to overclock the 1070 Ti Titanium a bit more than the Gaming model. 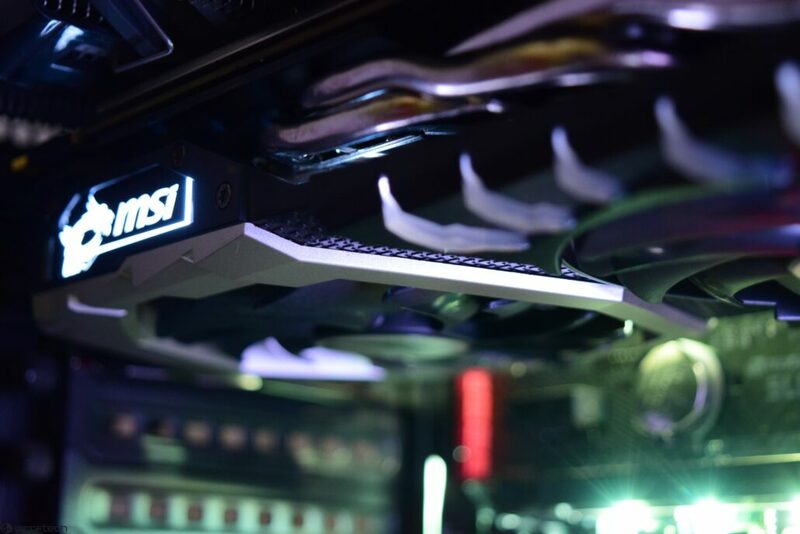 If you are in the market to get a GTX 1070 Ti, the Titanium model is going to be your best bet for a card that looks stunning and also performs great in games. MSI GeForce GTX 1070 Ti Titanium 8G – Click here to Purchase! Rocking a solid design, the GeForce GTX 1070 Ti Titanium is a great graphics card for gamers under the $500 US budget that performs well and overclocks even better. Great gaming performance at 1440p resolution. Performs nearly identical to a GTX 1080 in some titles. Great power and performance efficiency with 16nm FF (tweaked) process. Upgrade from GTX 970 and GTX 980 will be a big boost. Titanium design looks amazing, goes well with several builds. MSI's custom 10 phase PCB design is suited for manual overclocks. MSI Twin Frozr VI cooler offers great cooling and low noise output. MSI GTX 1070 Ti Titanium operates cool and silent under gaming load. ZeroFrozr Technology Included on Torx 2.0 fans. Uses 8 +6 pin connector config instead of reference 8 pin, offers higher OC and stability. Great overclocking potential, full tuning options with MSI Afterburner app. Lot's of display connectivity, great for VR and multi-display PCs. Price could have been a bit lower ($479.99 US). Some GTX 1070 Ti models may not make much sense over a GTX 1080 for the same price.